This addition to Kraft’s well-received body of work (Passionate Spectator, etc.) serves as the premier installment of the Flying trilogy and features the ever-engaging Peter Leroy. Upon hearing rumors that his Long Island hometown is being turned into a theme park based on his childhood cross-country flight, Peter returns with his levelheaded wife, Albertine, and a “fearsome conscience” to set a few things straight. Peter fears the media will uncover the truth about his heroic, history-making, 4,000-mile round-trip solo flight to New Mexico when he was 15: that the “earthbound portions” of the flight made up most of the mission. Nostalgic, homespun backstory reveals Peter’s childhood, his early fascination with flight and the frenetic events leading up to the construction of the “aerocycle” (based on plans printed in The Impractical Craftsman). The “Birdboy of Babbington” attempts to right his wrong with a heartfelt, revised expedition, but trouble looms, as Albertine may or may not have been kidnapped by a group of flyboy emergency medical technicians in this installment’s closing pages. Kraft’s unpretentious and engrossing storytelling make for a pleasant, escapist read. In the latest gleefully satirical installment in Kraft’s exuberantly inventive variation on Proust’s reclamation of lost time, his whimsical and contemplative hero, Peter Leroy, with his beloved Albertine at his side, embarks on a new round of hilarious and charming misadventures and recollections. Kraft circles back to Peter’s fifteenth year in Babbington, Long Island, when flights of fancy lead to aviation. Determined to fly to New Mexico, Peter builds an aerocycle with the help of his friends and a schematic from a favorite magazine, Impractical Craftsman. Actually, Peter never gets off the ground, but there’s no rush. This is the taxiing start of an airborne trilogy, and Peter is a delightfully meandering narrator, interspersing memories and anecdotes with musings over the nature of nostalgia and the imagination, the cosmic aspects of a junkyard, and various matters mythological and lexicological. Book by book, Kraft is not only toying with Proust but also shadowing another French luminary, Balzac, and his monumental The Human Comedy. Sweetly philosophical and archly literary, this is one very smart, tender, and funny novel. The past is recaptured in accents ruefully funny enough to turn Marcel Proust into Jacques Tati in the latest Chronicle of Peter Leroy. Still, only sporadically equal to the best of the Chronicles. But if you’re a Peter Leroy completist, don’t even think of missing it. Kraft’s (Passionate Spectator) latest pseudo-memoir by Peter Leroy, a quirky, intelligent, and admittedly unreliable narrator, recalls the summer he was 15, when he built an aerocycle in his garage and traveled 4000 miles from his hometown of Babbington, Long Island, to New Mexico and back. Leroy, a self-described hapless dreamer, is now a “seat-of the-pants memoirist.” As he puts it, “You don’t write about your life; you live your memoirs.” After receiving a cryptic postcard from a childhood classmate, Peter and his wise, ever-indulgent wife, Albertine, return to Babbington to find that city planners have re-engineered the town to its full 1950s glory. Central to the myth is Leroy’s legendary flight as the Birdboy of Babbington, which overlooked some technicalities that Leroy has been meaning to clear up for decades. This is an earnest, warmly nostalgic flight of fancy dotted with philosophical musings on the nature of fiction vs. reality, memory, and loss. Unfortunately, as the first of a planned trilogy, it seems slight, and the abrupt cliff-hanger disappoints. Buy where Peter Leroy’s other screwball adventures are popular. Proust gave the world “In Search of Lost Time.” Balzac enriched civilization with “The Human Comedy.” Eric Kraft bemuses and enthralls us with “The Personal History, Adventures, Experiences & Observations of Peter Leroy,” a series of funny, erudite and deliciously loony novels featuring a charmingly hapless, Long Island-born and -raised writer and the love of his life and guiding light, wise and wry Albertine. For readers fortunate enough to have already discovered Kraft’s scintillating and covertly philosophical tales, the latest installment, his 10th, is especially pleasing because it cycles back to Peter’s teenage years. This focus also makes “Taking Off” the perfect jumping-in book for readers new to Kraft’s vividly rendered and gleefully satirical fictional cosmos. Kraft’s ongoing saga of Peter Leroy is laced with cleverly off-handed tributes to various cherished literary works matched by covertly incisive takes on human nature, in general, and the American character, in particular. As one might expect from his seriocomic alignment with Proust, Kraft’s great subjects are the nature of memory, the forging of the self, and love. And what better avenue into the heart of these classic themes than a hero’s return to his hometown on a mission to correct old fallacies. You see, Peter has been living a lie. Way back when he was 15, he became the fair-haired boy of Babbington, Long Island, by allegedly flying solo to New Mexico, in a small airplane he constructed out of scrap metal and an old motorcycle in his family’s garage. The intrepid flyboy made banner headlines, and since then has endured wildly inaccurate accolades in numerous “anniversary recaps.” Now the “Birdboy of Babbington” intends to “set the record straight,” although, as he confesses in his preface, he hadn’t planned on revealing quite as much as he does in the uproarious tale that follows, illustrations included. And this is only the first novel in a promised trilogy about Peter’s aeronautical fiasco. Here Kraft’s adept spoofing expands to embrace the old do- it-yourself culture, a lost aspect of American know-how now that all our gadgets are digital and built to break. Motivated by envy - a friend of Peter’s has won a coveted scholarship to the summer institute at the New Mexico College of Agriculture, Technology and Pharmacy - our young hero decides that he, too, must fly to the Land of Enchantment. Armed with plans from a madcap variation on the magazine Popular Mechanics titled Impractical Craftsman, and assisted mightily by family and friends, he succeeds in building an aerocycle, and he journeys to New Mexico and back. But he only flies his homemade plane the distance of about 200 feet. Kraft makes wily use of the tried-and-true story-within-a-story structure. While he whisks the reader back in time, Peter and Albertine, now living in Manhattan, visit Babbington after a long absence and find it has been transformed into a cheesy theme-park version of the town circa 1956 when the Birdboy built his amazing flying machine. Peter and Albertine puzzle over this manifestation of cloying civic nostalgia and desperate bid for tourist dollars in a sly dissection of our society’s ability to commodify and hence desiccate anything of meaning, then find themselves navigating a sequence of revealing calamities and bittersweet recoveries. Kraft is a judicious literary magpie, not only lifting bits from Proust and Balzac, but also from Mark Twain and Evelyn Waugh. And let us not neglect his riffs on the story of Daedalus and Icarus, or his hero’s mythic nocturnal junkyard quest for parts for his flying machine, a scene that evolves into a complexly evocative metaphor for forgotten memories awaiting reclamation in “the dark recesses of the majestic salvage and wrecking yard of the mind.” Because Kraft expresses an abiding faith in steadfast love and impossible dreams, because he uses humor to shape a humanistic ethos, and because he takes profound pleasure in the resonance of language and the magic of storytelling, reading Kraft’s inventive and effervescent tales is a rare and sustaining joy. Repeat the same misinformation often enough, and it becomes the truth. And that “truth” soon develops a life of its own that can make things difficult when you try, in late middle age, to come clean about an airborne odyssey you supposedly took in an “aerocycle” you built yourself when you were only 14 years old. The center of Kraft’s fictional universe is Babbington, Long Island, “clam capital of America” and a Kodachrome-bright slice of 1950s Americana. But beneath Kraft’s bright surfaces and dazzling comic antics, there’s some serious investigation going on into the interactions of memory, reality and invention. All three do battle in his new book. The story: For decades Peter’s adoring public has thought of him as “the ‘Birdboy of Babbington,’ the epitome of American ingenuity and pluck, teen division.” And for decades he has let them keep their illusions. But the truth is that Peter’s “longest sustained period of flight” covered roughly 6 feet, and the rest of his round-trip journey between his hometown of Babbington and New Mexico was either earthbound or aboard a commercial airliner. How is he ever going to explain that? You won’t find out in “Taking Off.” Indeed, in this first volume in a projected “Flying” trilogy, a reminiscing Peter wanders so far from the point that he only gets around to the moment when he climbed aboard his “aerocycle” in the very last paragraph of the book. Peter’s lifelong devotion to his skeptical but adoring wife, Albertine, is front and center in his thoughts. So is his boyhood reverence for the magazine Impractical Craftsman, where he found the inspiration for his recycled-junk flying machine. The contrast between the mature Peter (cash-flow-impaired, getting a little desperate) and the young exuberant Peter (crestfallen from time to time but seeing no limits to his horizons) provides the tension that animates the book. In the end, the reader is left only with a beginning: Peter in his “aerocycle” on the runway (Babbington’s Main Street), about to take off for who-knows-where, who-knows-how. With the exception of that “aerocycle,” all the story’s elements — Babbington’s theme-park future, Peter’s confession of the facts behind his journey — are left up in the air . . . which makes for a splendid start to this promising “Flying” trilogy. Peter Leroy has come unstuck in time. Apologies to Kurt Vonnegut for borrowing the famous opening line from Slaughterhouse Five, but Peter has a lot in common with Billy Pilgrim, Vonnegut’s mystical protagonist. Both of them are lost in time. Billy Pilgrim moves across the decades from his sedate family life to his domelike home on another planet to his imprisonment during World War II. The time shifts of Peter Leroy — the hero of Eric Kraft’s new novel, Taking Off — aren’t as dramatic as Billy Pilgrim’s, but he does walk that tenuous high wire between now and memory. Taking Off is a deft piece of work — a great tale of a young man with big dreams and maybe not much more. We’re not sure — because Peter’s not sure — what really happened and what he only imagined. But the story revolves around his teen exploit as the “Birdboy of Babbington” — Babbington being his bucolic Long Island hometown of the 1950s. He was celebrated for flying his aerocycle (half airplane, half cycle) from New York to New Mexico when he was a teenager. But did he really? What did he do and what did he only imagine? Deep into middle age, Peter and his wife journey from his Manhattan home to Babbington, which has been turned into a theme park of a more innocent America — frozen in time around the time that Peter did (we think) his famous deed. He begins to doubt his personal history and with the prodding of Albertine, his beloved wife, he takes a sentimental journey through his past, trying to reconstruct his life. There is no Babbington on the map, though the world Eric Kraft describes is so real, you’ll be driven to pull out the Rand McNally to look for it. Peter also recreates his childhood with astonishing clarity. He finds plans for the aerocycle, for example, in a magazine called Impractical Craftsman. Of course, no such magazine existed, but you will believe that it did. (Kraft is also skilled as a graphic artist and he illustrates his book with mock magazine covers and advertisements.) The book takes several flights of fancy with language, memory and loving husband-and-wife banter that never even gets close to being cloying and sentimental. There are a lot of laugh-out-loud moments, as Peter tries to figure out how to build his aerocycle from the instructions in Impractical Craftsman: “First, find a surplus motorcycle.” He also takes a detour into the subculture of welding and discovers that there are welding groupies. Taking Off is a wonderful book — a hilarious and masterfully told tale written with such an economy of language, it reads with the urgency of telegram. It lives at the intersection of memory and imagination — a crossroads we all face now and then. 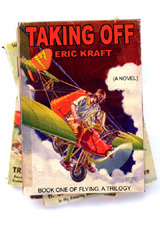 And it won’t spoil the ending to pass on this good news: Taking Off is the first book in Kraft’s “Flying Trilogy.” It’s good to know there’s more to come. Imagine an All-American boy in an All-American town. And imagine that 15-year-old All-American boy building an aerocycle in his garage and flying from suburban Babbington, N.Y., to New Mexico. And now imagine, decades after the flight that earned Peter Leroy fame as “The Birdboy of Babbington,” that All-American boy has decided to come clean about his flight. Particularly since his “flight” was only about 180 feet in the air, and the rest of the trip was made up of “taxiing” his way cross-country and back home again. “Taking Off” opens when Peter Leroy, the author’s oft-used eponymous alter-ego, returns to Babbington with his wife and muse, Albertine, and finds that the town literally hasn’t changed at all since he left. In an effort to rebrand itself as a tourist destination, the Chamber of Commerce has decided to make Babbington “The Gateway to the Past.” They have selected one day from the past and re-created almost every aspect of the town - from fashion and automobiles to conversation overheard in restaurants - to coincide with the actual events of that day plucked willy-nilly from the 1950s. As fate would have it, that day is the day that “The Birdboy of Babbington” successfully “flew” back home from his sojourn at the fictitious Faustroll Institute of New Mexico. Leroy decides to begin writing his memoirs and come clean about the truth of his flight before someone else - discovering the flight that has suddenly become the talk to the town once again - discredits him. Kraft is a student of the Richard Brautigan school of terse chapters and folksy, homespun style, but without any of Brautigan’s underlying weariness and sadness. His style is more like that of the nostalgia-soaked twang of Lake Wobegone’s Garrison Keilor, and “Taking Off” reads like the kind of book that would be best enjoyed while sipping lemonade out on the porch swing as the sun sets and the cocker spaniel is slipping off into sleep at your feet. Kraft (as Leroy) alternates between telling his story - his discovery of schematics for an aerocycle in “Impractical Craftsman” magazine and the impetus of his flight - and discussing aspects of the story with Albertine. The result is a sweet story that meanders gently like a winding stream, branching out here and there and giving the reader ample room to sit under a shady tree and consider where it will go around the next bend. It’s like listening to a story from your grandfather, complete with digressions, tangents and exaggerations. But unlike your grandfather, Kraft and the good folks at St. Martin’ Press are charging you $23.95 (I know it’s a hardcover, but you can read it from cover to cover in just a few hours) for pleasure, and most likely another $23.95 for each of the next two chapters. Call me cheap, but $71.85 plus tax is pretty steep for what is essentially a neat little yarn that wouldn’t be out of place in a “Reader’s Digest” condensed anthology. “Taking Off” is a pleasant read with wit, charm and some gentle satire. The graphics interspersed conservatively throughout are terrific, such as schematics from “Impractical Craftsman” and a page reproduced from the fictitious book “Antique Scandals: The Mischief Behind the Myths” that explains how the mythological Minotaur was conceived, with strategic words blacked out to preserve the innocence of its young readers. These bring the reader deeper into the self-contained world Kraft has created, and hint at the nostalgic sweetness that is at the heart Peter Leroy’s journey - his “flight” and his journey of self-discovery. Kraft has created an engrossing story with a lovably naive protagonist in Peter Leroy. But the story would be better served if he could have deleted some of that folksy meandering and told the story in one volume, rather than spreading it out in a trilogy. Sometimes grandpa needs a gentle nudge to get to the point.